On Friday afternoon, I walked the stones. Some way out into the bay, I thought: It doesn’t matter where I am. I can live anywhere. I felt a disinterested calm. The stones go all the way across the water. You can get off on the other side. I had imagined they would end, like a pier, and that I would stand still for a while out there, looking, listening to the waves move. At about the halfway point, the sea was washing over my path. The tide was high, and pushing in. I had no way of knowing, should I proceed, would I get back. I decided to proceed. On the other side, I crossed the dunes and felt my feet on this far shore of my Atlantic. It was windy and uncomfortable to stay, so I went back across the dunes and walked along the salt marshes to the lighthouse. I passed a middle-aged couple sitting together in silence. I took a photograph of a strange little building I could live in. I looked up at the lighthouse. “Rapunzel! Rapunzel! Let down your golden hair!” I called. Nothing happened, but I felt what it might be like to be a man. Heading home, I was only a little reluctant to disturb what I took to be two snipe at the edge of the marshes. When they rose and wheeled and piped, I watched them in the sky and thought of the snipe at the dam at G—. Karen Martin is a writer of short fiction and an editor. She originates from South Africa, where she has lived in the countryside outside Johannesburg for the past fifteen years. She is presently a Cornelia Carhart Ward Fellow in the creative writing MFA programme at Syracuse University. 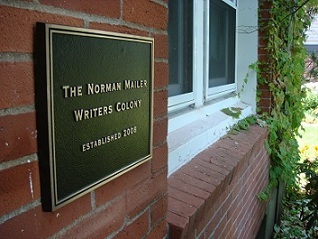 She is using her fellowship at the Norman Mailer Writers Colony this summer to complete her first collection of short fiction.